The Mohawk turn (some people call it the Eagle turn) is a fairly simple skating maneuver to perfect if you are already comfortable on your edges. One player who seems to use this move quite a bit is Sidney Crosby (when he’s not getting hit in the face with pucks). In order to perform the move the skater simply puts their heels together and points the toes out, this almost aligns the skate blades in-line allowing the player to carve or turn in a circular motion. First practice while standing still, you can even practice off the ice. Bend your knees a bit and point one toe out, now lift the other leg and point the other toe out, then step down (heel to heel). With your legs you should be making a “fat diamond” shape. Now try the same thing on the ice (with skates on). It may be a bit harder because you are on your blades, but work on getting comfortable in that position and balancing. When doing this move while moving you will be on both inside edges of the skates. In this video I show you how to do the Mohawk turn, a few drills you can use to get better at doing it, and a few game situations when you might want to use it. You can see Crosby using this move a few times in the clip below. Thanks for reading! If you want to share this article or subscribe to our blog for more check out the widgets below. As a hockey/skating coach for over 20 years, let me first say that Jeremy and the rest of the Howtohockey crew have some great stuff out there and I would strongly recommend checking out more of their videos. I just wanted to point out a technicality on the definition of the Mohawk. 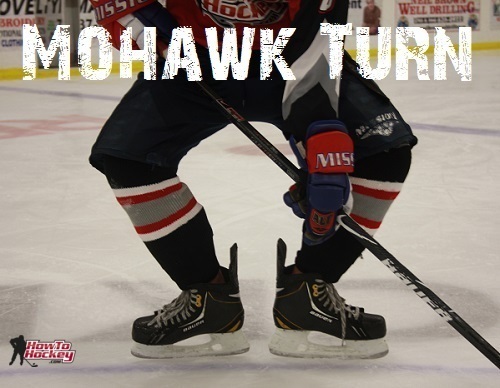 The Mohawk is a change in direction (forward to backward or vice-versa) from the edge of one skate to the same edge of the other skate (in this case, inside edge to inside edge). It is a one-foot to one-foot move and is used quite often in hockey. A couple of minutes into the video, when Jason is going around the circle rocking from foot to foot, those are Mohawks. The turn, with two heels together and both feet on the ice is, technically, a spread eagle. Nothing wrong with his technique or the drills, just a note on the skating terminology. Looking forward to seeing more! A good way to learn is without gear as you can you can have more flexibility. And its always fun cause it looks so funny.